June 23 – Last week, it was Iraq and Ukraine. This week, it’s all Iraq–and Syria. And Jordon. And Afghanistan. And seemingly, the entire Middle East. Yes, the world has resumed it’s march toward World War III. After erupting in Iraq and Ukraine last week, violence this week was concentrated in the Middle East. The Corporate Media announced that practically every Muslim country in the Middle East was in danger of the latest threat: a group dubbed ISIS. Almost on cue, as soon as the pope conducted his “peace prayer” photo op a few weeks back, violence broke out. Israeli jets struck nine targets in Syria. It’s a shame the pope didn’t include the other countries in the Middle East. That’s what was written here last week. This week–again, almost on cue–the Corporate Media began making references to Syria and war. And if “war” and a Middle Eastern country are mentioned in the same sentence together, it won’t be long until “World War III” gets mentioned. THE UP SIDE? Ukraine has been pulled from the media spotlight after being shoved front and center only a week ago. In fact, a cease-fire has been declared in the Eastern European country–shaky though it may be. For a couple of weeks, there was a complete disappearance of the terms “World War 3” and “World War III.” Now, for the second straight week, both phrases have re-entered the headlines of the world’s media. What we penned last week on Asia and the “Big One” continues to hold true this week. This highlights the transitory nature of peace and worldwide war. Over the last week, the shooting only increased in Iraq and surrounding countries. 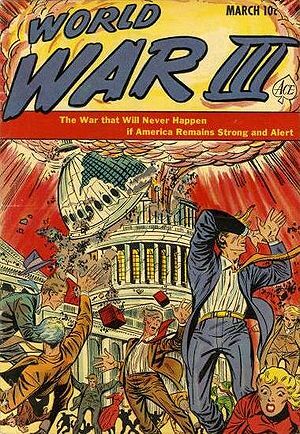 However, the articles proclaiming that “World War III has begun” seem just a little bit premature. TedBits: World War 3 has begun! Islamic Caliphate is Born, World War III has begun! Jordan Next Target for ISIS? Tensions in Ukraine have quieted–for this week. The country seems to be on a rollercoaster: one week quiet, one week with violence. This week was relatively quiet. IRAQ: Again, one has wonder where the invincible U.S. Air Force is in all of the fighting. The AF has not lost control of Iraq’s skies and it still operates an unknown amount of bases in the country. Obama even mulled over ordering “air strikes,” though one has to wonder what the generals in Iraq are doing to earn their keep?!? Lines of ISIS military vehicles being photographed and the pictures splashed across the world’s media continue in Iraq. This week’s “Muslim extremists/terrorists/insurgents” go by the convenient name of ISIS = Islamic State in Iraq and Syria. Convenient in that the “terrorists” named their organization in English. With fighting continuing in Iraq, there’s a 34% chance of World War III; which is NO CHANGE. Ukraine settled down, the Middle East acted up. There’s a sense that Obama is supposed to “lose” some significant chunks of Middle Eastern real estate prior to the 2016 election, but that is all likely only beginning now. July 29 is the 100th anniversary of the start of World War I. Elite string-pullers have been known to be nostalgic for such dates, but there’s bigger fish to fry in 2014. So while July 29 may herald something significant, World War III is probably months away. A little sporadic activity in Africa. Jordan – tensions over ISIS up. Russia – steady, with continued interest in Ukraine. NATO – NATO intercepted Russian bombers this week. The “Russian bombers” have been busy the last several weeks. June 23, 2014 – The good news: Ukraine has once more quieted down. NOTHING HAS CHANGED (only other countries were mentioned as possibilities to join Iraq for a future “liberation” by American forces. Iraq is in full-blown melt-down. Expect this to continue and escalate in neighboring countries, reflecting badly on Barack Obama’s handling of the Iraqi situation. The ultimate loss of Iraq could occur in stages, which will string along any Americans still emotionally invested in that theater of war. A protracted loss will also give the media a chance to thoroughly butcher Obama. This past week, the Corporate Media mentioned Syria, Iran, Jordan, Saudi Arabia, Qatar and Afghanistan as possible companions to Iraqi violence. After Iraq and Afghanistan, What Should Our Policy Be?